Reflections on the beginning of Sunday School without kids? What to do? Holistic worship to the rescue. Sermon delivered and recorded LIVE on September 19, 2010 at the Armenian Church Youth Ministries Center, Glendale. Thoughts on the power of the Holy Chrism to transform and change. Re: Axtamar service and having the spiritual maturity to understand the transforming power of the Holy Spirit. 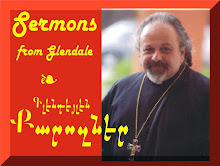 Sermon delivered and recorded LIVE at the Armenian Church Youth Ministries Center, Glendale, CA 09/19/10. Sermon on the meaning and purpose of life, as explored through our work and labors. Delivered and recorded LIVE at the Armenian Church Youth Ministries Center, Glendale, CA, 5 September 2010.